Although AutoCorrect is a useful feature most of the time, it can produce some strange errors that are more annoying than the errors it is supposed to fix in the first place. 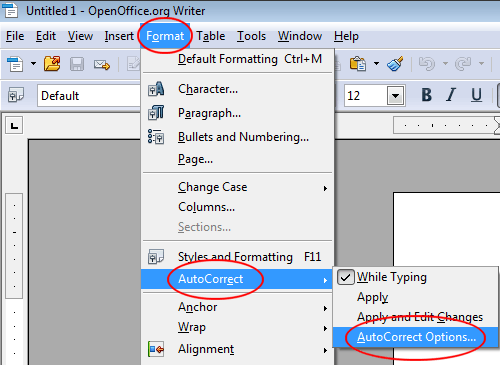 Like most modern word processors, OpenOffice Writer has a built-in AutoCorrect feature that usually works in the user’s favor to reduce or eliminate typos. 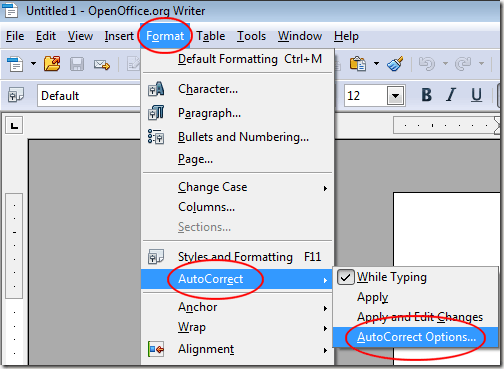 For the other times, you can learn how to change the AutoCorrect options in OpenOffice Writer to create a more customized experience with the feature. Publishers of word processors are constantly adding features to their software to make editing text faster and more convenient. Checking your spelling and grammar as you type are passive features that let you choose whether to make the changes suggested by the program. Other features such as AutoCorrect are applied automatically, forcing you to correct whatever errors the feature adds to your document. One example of an AutoCorrect error occurs when using parentheses. For example, when typing (c) into OpenOffice Writer, AutoCorrect changes it to the copyright symbol or ©. This is OK if that’s what you intended but if you often need a C in parentheses, the feature is more work than it’s worth. 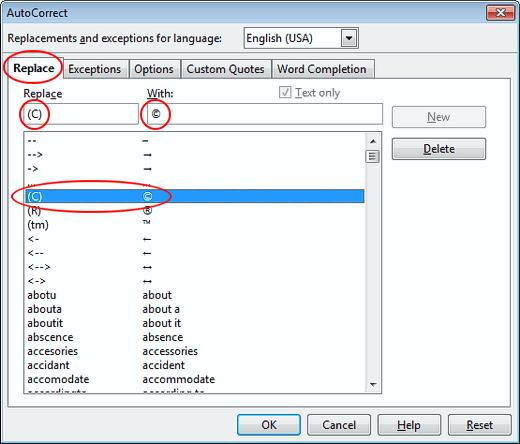 Luckily, OpenOffice offers a simple way to change AutoCorrect’s options to make the feature work more like the way you need it to. To use the example above, we will remove the AutoCorrect feature that automatically changes a C in parentheses into a copyright symbol. Open Writer and click on Format>AutoCorrect>AutoCorrect Options. You should now be looking at the AutoCorrect window. Click on the Replace tab and notice that the window displays many different entries. Locate and click on the one labeled (C) and note at the top of the window that (C) is in the Replace box and © is in the With box. Since we no longer want AutoCorrect to automatically make this change, click the Delete button and the feature will no longer appear in the list of entries. Note that you can do this for any of the entries in the list. You can also add entries by placing text in the Replace box and the text you want AutoCorrect to automatically change it to in the With box. Clicking the Replace button adds the entry to the list. If you want to restore the entries to their default settings, click the Reset button and all entries will be restored just as they were when Writer was first installed. Although the AutoCorrect feature in any word processing program can be a help with typos, there are times when the feature actually adds errors to your document. 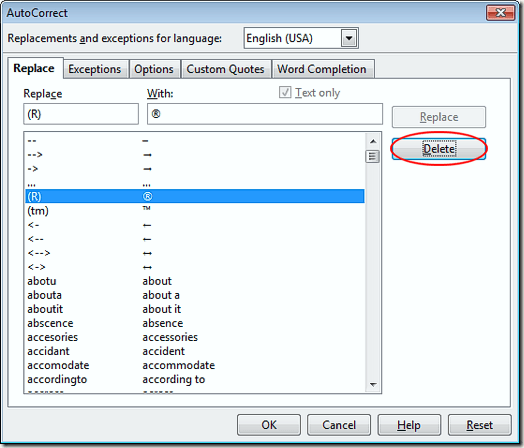 OpenOffice Writer adds an easy way to change AutoCorrect’s options to stop these errors. You can even add custom options to AutoCorrect to speed up your creation of a document. 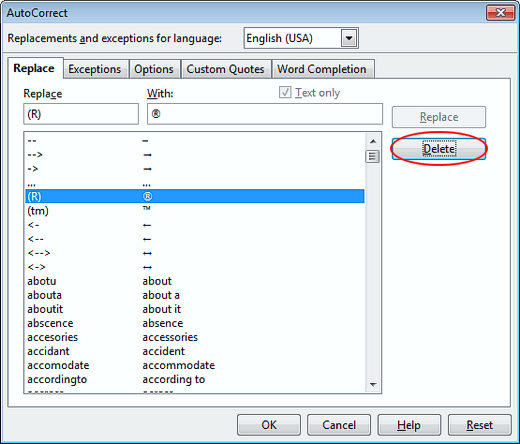 One click of the Reset button restores all AutoCorrect options to the way they were before you added or deleted any entries to the list.